Bear with me now as we delve into technical detail. The pattern calls for 4 sets of double decreases, each decrease being made about 4″ in from the side seams. When knit in the round, this means 8 stitches decreased on each decrease row for a total of 32 stitches decreased. I made 7 sets of decreases for a total of 56 stitches decreased, to 136 stitches (68 each side). The pattern calls for 74 stitches at the waist for an XS and 80 for a S. So, I have now decreased from a size S at the hips, to 6 stitches less (per side) than the XS. The bust increases are single, rather than double, increases so each increase row adds 4 stitches when knitting in the round. As the shaping disrupts the K2P2 pattern, and the aim is to end up with the pattern intact, you must make sure that after your increases are complete you have K2P2 all the way around. I made 6 sets of increases, to end up with 160 stitches (80 each side). I increased 8 times, at 2″ intervals for a total of 59 stitches. My goal was to knit it 2″ longer than the sleeves on my Audrey pullover because Emma has longer arms. I thought I had done that, but as you can tell from the photos, once it is on it stretches horizontally and this makes it shorter. This sleeve is not yet long enough for Leah so I have to make it longer still to fit Emma. I won’t make any more increases, however, as I would have to add 4 more sets of increases to keep the rib in pattern. 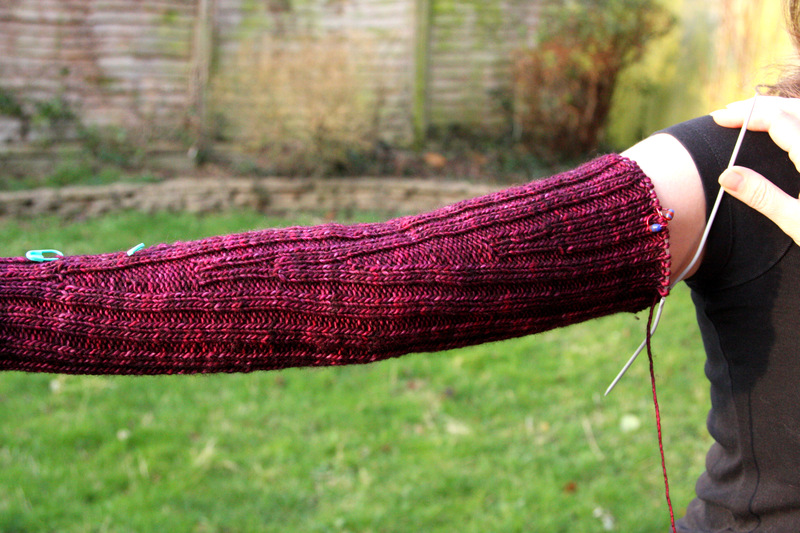 It took me an entire week to make this sleeve (egads! ), mostly because I kept second guessing myself and measuring and remeasuring and contemplating. Now that I have it all figured out, I hope to turn out the second sleeve fairly quickly. This entry was posted in Main and tagged Audrey pullover, Kim Hargreaves, Knitting, knitting sleeves in the round, re-sizing knitting patterns, Rowan, Venetian Audrey by knitigatingcircumstances. Bookmark the permalink. A bit too complicated for me but very interesting. 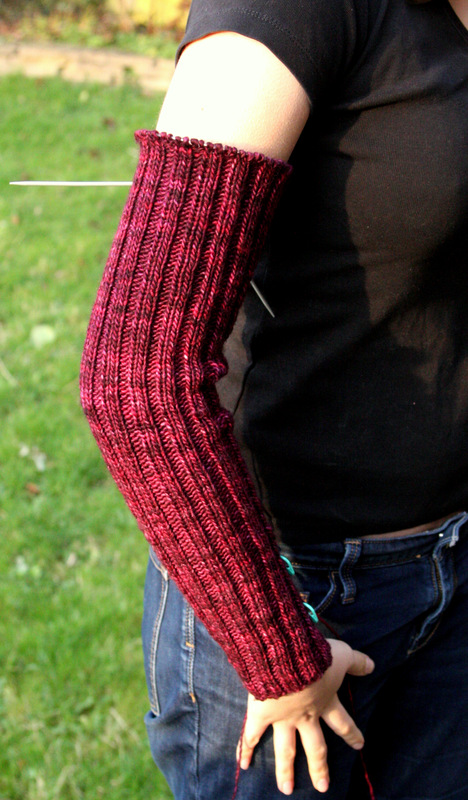 Wondering, if you weren’t doing so many adjustments, do you usually knit the two sleeves at the same time? Hi Joss, when knitting sleeves in the round, I would do them one at a time of course. When knitting flat, many knitters knit two at a time, and I can see the advantages (mainly making sure that they match and that you have the increases aligned). I have tried it a few times however, and it never seems to work for me. I read a recent post from someone who was doing fair isle knitting and she knit both sleeves in one piece with steeks between them and then cut them apart and sewed them. I love that kind of brazenness. Not boring at all! It’s always nice to see how others modify patterns and find a way to make things work for them. 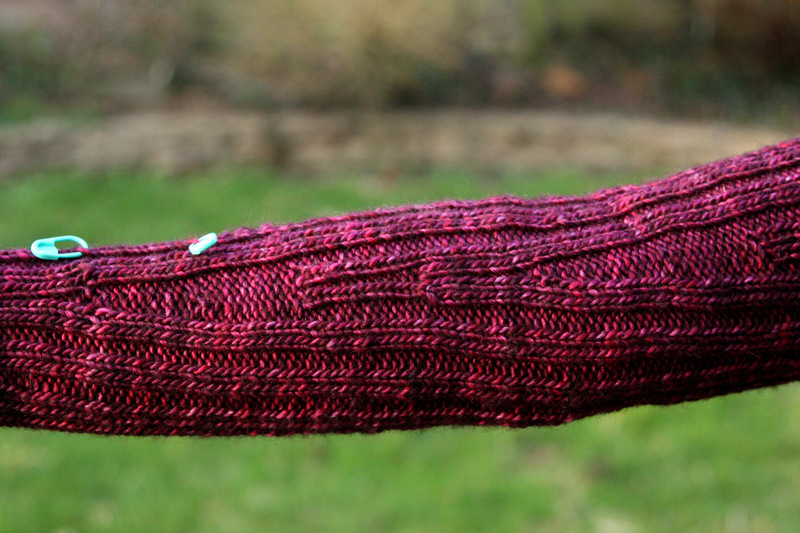 I really like the adjusted sleeve pattern – looks very interesting and like it is supposed to be made that way. Thanks for the comments. I always like to read the fine details of what others are doing with their knitting, but these kinds of technical posts can be hard to write. I am glad that you found it interesting. I agree, very interesting and informative. Plus, you’ve managed to transform K2P2 rib into a subtle, stylish detail that takes this sweater to a new level. Thank you; these comments make me feel much better about what I’m doing with this sweater. I find it hard to be second-guessing aspects of it without Emma around to try it on every step of the way. I am really thinking I need a dress dummy, but don’t know where I’d put it. Not boring at all! Just the stuff that goes into making a sweater great instead of just a plain ol’ sweater. I agree, not boring at all! It’s part of the process and a good thing you documented it here. Hopefully that second sleeve is coming along nicely. I once read a tip on Rav regarding sleeve length. If you use a provisional cast-on, you can always adjust the sleeve length up or down as needed. Most tips like that go through my mind like a sieve, but that one stuck for a change. It’s food for thought!